It’s been said that a New Year’s resolution is bound to be broken. Maybe people set the bar too high. My favorite acknowledgment of that is the one that goes, “My New Year’s resolution list usually starts with the desire to lose between ten and a thousand pounds.” It turns out that losing weight has perennially been No. 1 on New Year’s resolution lists, and that was true this year too. How do we know? As part of our annual Brand Keys Customer Loyalty Engagement Index (those results will be available January 21st) we ask about what consumers planned for their New Year’s resolutions in 2019. The first 10 are “perennials.” The next ten vary somewhat year-to-year, although this is the first year #12 and #13 showed up! Maybe if you can keep #12 and #13, #14 will be inevitable! Maybe #20, too. We wish you success in your 2019 endeavors. Whatever’s on your list. 2. More shoppers would shop beforeBlack Friday. 3. Retailers would encourage this consumer-shopping paradigm, and promote “Pre-Black Friday-like” sales. A lot. 5. Black Friday would still embody a retail raison d’être, and a “tradition” or “ritual” for some families, but would become a relic of 20thcentury retailing, with brick-and-mortar sales declining, Y-O-Y. 6. Cyber Monday would take over the role formerly played by Black Friday and would reap the benefits. 7. Top-3 on-line beneficiaries would be Amazon, Walmart, and Best Buy. 1. Black Friday foot traffic was down 6%. 2. Black Friday sales were down 7%. 3. It’s the 4thstraight year in a row. Not an encouraging pattern. 4. Cyber Monday sales were up 18% Y-O-Y. 5. Amazon had its biggest shopping day in the company’s history. 6. They sold 100 million products. 7. Clicking “Add to Cart” has become easier than finding a parking space. For now, and the foreseeable future, when it comes to the holidays, for consumers there’s only one shopping day left ‘til tomorrow. You can’t have missed them. The deluge started 3 weeks ago. In fact, you’ve probably come to expectthem. Brand Keys wishes you and your families a Thanksgiving filled with all the goodness of the season (it’s stillthis coming Thursday) and plenty of time to enjoy it! Given the extraordinary degree of political enmity in the United States and the upcoming midterm elections, it seemed an apt time to revisit a survey analysis we cautioned brands (and tangentially, voters) about 2 years ago. “Patriotism” is pride. Pride in one’s country and a willingness to defend it. Pride in what a brand stands for. It’s courage, it’s freedom of speech, it is liberty. It is ultimately a set of values people admire and brands can use to better position themselves. “Nationalism,” on the other hand, has become the belief in the superiority of one country over another and its usual form is aggression, hostility, and belligerence. For brands it has become, more-often-than-not, whothe brand represents. It’s the Bizarro world of patriotism. It’s mean and it’s small. It pits citizen against citizen, black against white, Christians against Muslims. Patriotism is rooted in unity and values. Nationalism is rooted in rivalry and odium, and usually results in violence. BOTTOM LINE WARNING TO BOTH BRANDS AND POLITICIANS:To no small degree, shifts in the drivers of patriotism have dramatically changed how consumers look at brands. Playing the nationalism card works only with a very, very small percent of any population. Smart brands will know what consumers are willing to believe about them and will leverage the hell out of that. They end up winners. The less smart brands won’t know the difference. Oh, and there's a big difference between being patriotic and being political, another thing the American consumer is on to. Patriotism isn’t a campaign. It isn’t changing the name of your brand to “America.” It’s not short, frenzied outbursts of emotion – with or without flags. Those are more promotional than patriotic and – more-the-pity for brands – consumers know it. They can feel it! Real patriotism is the quiet and steady dedication of a lifetime’s work – whether you’re speaking of a brand or about a person. Some approaches can be categorized as “liberal,” and others “conservative,” but perhaps Mark Twain’s definition is the way to go; “Patriotism is support for your country all the time – and the government when it deserves it,” a sentiment that pertains to both brands and politicians. And if you can configure an important value – whether for a brand campaign or a political campaign into something emotional and believable, consumers (and voters) will not only stand up and salute, they’ll buy whatever it is you’re selling! For many years, we’ve urged clients to trust predictive brand metrics. They work really, really well for brand and media planning. Well, no surprise, like the rest of the marketing world, planning for digital became more complex. So Brand Keys came up with some new approaches, which the ARF applied in their cross-media ROI work for the “How Advertising Works, Today” initiative. And our predictive metrics did precisely what they were supposed to do. Predict. They predicted how well media platforms reinforced consumers’ emotional engagement with a brand and what combinations of media worked best for the brand. Strategically. If you do that, you’ll alwayssee positive behavior in the marketplace, meaning sales and profits, as opposed to just tweets and likes. Last week, a MediaPost article announced brand data has become more pivotal in determining which combinations of digital ad stacks will deliver the best strategic advantage. Essentially, it welcomed brand metrics back to a seat at the Media planning table, something we heartily applaud. Happily, there’s no need for brands to reinvent the wheel, or in this case, a way of identifying which combination of media platforms will work more effectively for your brand. We’ve already done that with B2ME. If you’re interested in optimizing your digital ad stack (or any other set of media platforms), we’d be happy to help. Because we can confidently predict increased brand engagement and sales for brands that predictively plan. In the digital or analog world. 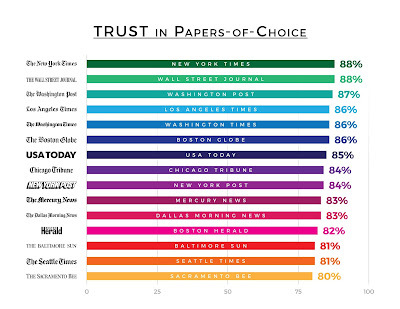 A recent Brand Keys study measured “trust” among readers of their newspapers-of-choice. 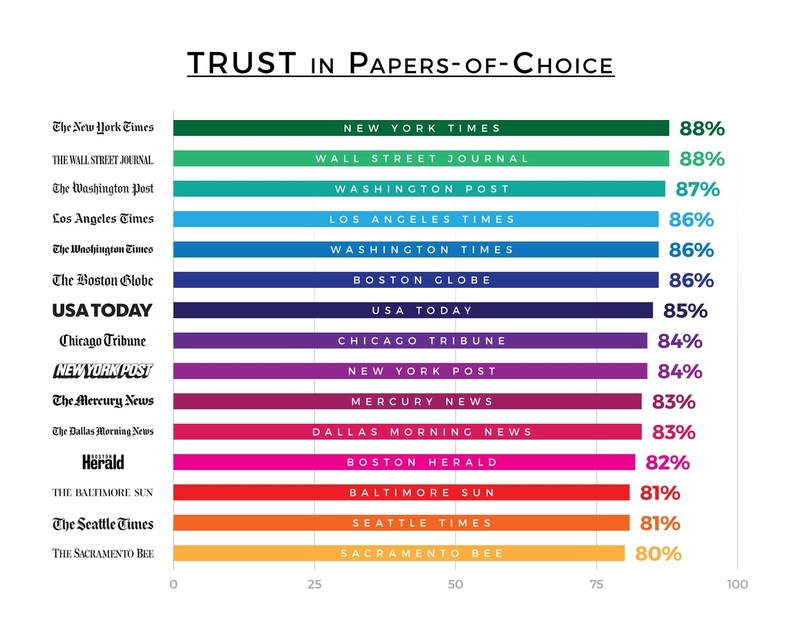 Sure, ideology self-defines selection when it comes to subscribing to a newspaper (in print or digital), but “Trust” accounts for 41% of actual newspaper brand engagement. SIDEBAR: Since President Trump has labeled The New York Timesas “failing,” and virtually every other news platform as “fake news” and/or “enemy of the people,” we also measured how much “trust” newspaper readers had in the President. Mr. Trump was rated an overall 24% (five percentage points lower than TV news viewers, 64% lower than The New York Times or The Wall Street Journal). Democratic newspaper readers rated Mr. Trump 9%, Independents 16%, and Republicans 29%. Eighteen percent (18%) of the sample had “No Opinion. The next wave of the Brand Keys Media Trust Tracker will visit “Online” Platforms. Brand Keys 22nd annual Loyalty Leaders List is an analysis providing a comprehensive, cross-category perspective of brand loyalty today. Loyalty’s Top Line: Digital and tech brands held their ground. Traditional brands worked harder and moved up the list an average of 11 positions. Big winners included T.J. Maxx, 5 Guys Burgers, Zara, and Lyft. Oh, joke all you want about certain brands taking over the world, but from a loyalty perspective it’s a reality. So not so much of a joke, and the loyalty Rule of Sixplaying itself out in the real world. Consumers that exhibit high degrees of brand loyalty in one category are 6 times more likely to use the same brand in another category. Brands in multiple categories this year were Amazon, Apple, and Google. For this year’s top-100 Loyalty Leaders click here. Loyalty’s Bottom Line: Brands that make loyalty and emotional engagement a strategic priority alwaysappear high on our list. Most importantly, they alwaysappear at the top of consumers’ shopping lists too. Want to know what other brands are up to? We invite you to read Janet Morrissy’s New York Times Advertising column, “Legacy Brands Tell Younger Generations: We’re Not Just for Your Parents.” Or in some cases, your grandparents. Today you don’t have to rely on just hope, because our psychologically-based, emotional engagement metrics canidentify values consumers can’t, won’t, or haven’t yet articulated about what they truly desire beforeyou start your re-branding efforts. More importantly those metrics identify values that get consumers to buy.